I am 32 and career wise, I am not where I want to be. I wanted to write and create arts and crafts but life got in the way. Lately though, some people made me realize that I can still pursue my dreams. Early this morning, I spoke with someone via twitter and an idea was born. I don't want to discuss it here yet coz I think its really awesome. Yep, its that awesome. So there ... 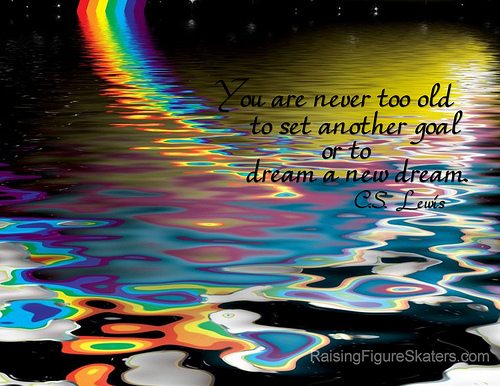 I'm never too old and you're never too old to set another goal or dream a new dream. I feel for you! I was at that point sometime last year, before I decided to write and blog again. Indeed, there is no old person for a dream. As long as you're breathing, able to carry your body and do task you are still in the running to make your dreams happen. Nakaka excite yang idea na 'discreet' pa kumare ah..Good luck! Whatever it is, you will excel in it.